Made with 100% New Zealand grown potatoes. Original cut chips with mouth watering sourcream and chive seasoning. 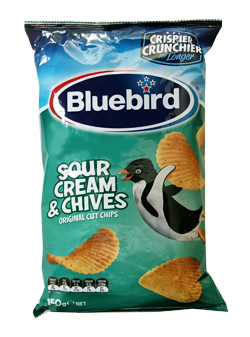 Bluebird are proudly kiwi and proud of their Chips. Potatoes, Palm Oil, Sour Cream & Chives Flavour (Salt, Sugar, Onion Powder, Tapioca Starch, Dextrose , Flavour Enhancers (E621, E635), Milk Powder, Yeast, Flavours (Gluten, Milk, Soy), Garlic Powder, Herbs, Food Acid (E296), Spice Extracts).